“Little Donnie Trump, the dumbest kid in the class.” This only somewhat facetious refrain was proffered on a day when Trump had said something particularly insane, by a friend of my parents who attended school with The Donald when they were just boys. 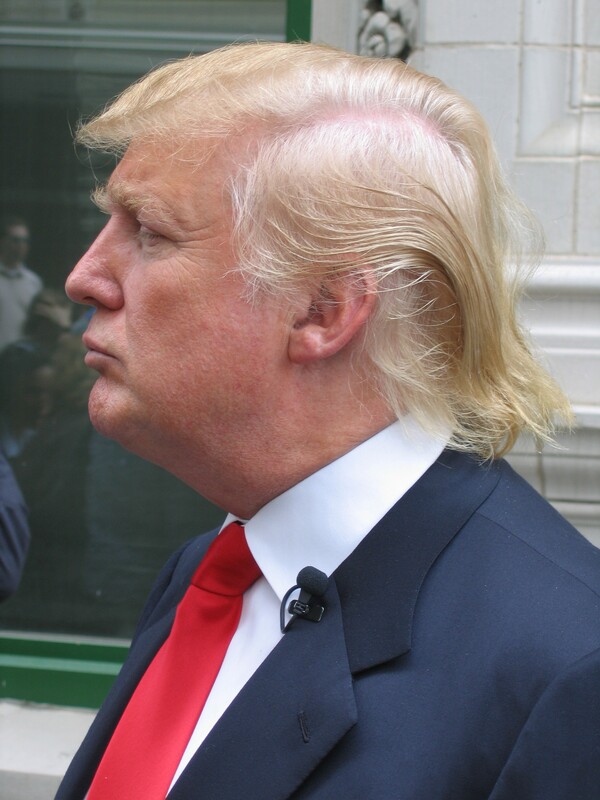 Trump is a potential presidential candidate who has most recently hitched his hairpiece to Birtherism, or the slightly-less-clever-than-a-comb-over theory that President Obama only plays an American president on TV. In this fantasyland of conspiracy and fear of mind-control via fluorinated water, the president is the amazing beneficiary of the most prescient plot in human history – next to the invention of the hot dog centuries prior to the creation of baseball. In Obama’s case, it involved the planting of a birth announcement in a Honolulu newspaper to hide his “Kenyaness” and falsely convert him into an American citizen. Because one day, he would inevitably want to be the first black president, and at that moment it sure would come in handy. Trump is a guy who is famous for spinning a false resume – as a supposedly intelligent businessman – into fame and additional fortune. Much like with our national political conversation, the truth is incidental. Even when one’s tall tales can be empirically proven to be as fake as the synthetic turf grass on Trump’s noggin. It is of no matter. As tennis player Andre Agassi used to say in ads for Nikon, “image is everything”. In Trump’s case, he has used over-the-top self-promotion and atavistic bravado to sell himself as the most successful businessman ever. Once that was largely accomplished, no number of declarations of bankruptcy for his casino empire (are we on two now, or three?… It’s pretty easy for one to lose count) or even the destruction of a professional football league (see USFL) could change that. It was a set narrative, and the media doesn’t do introspection. So, like so many of the famous who have not done anything of value to have earned that distinction, Paris Hilton, Levi Johnston, The Real Housewives of Everywhere – this walking Jersey Shore character is now ubiquitous on news shows. Worse, he’s considered a knowledgeable source on a whole range of issues, particularly business regulation, budgets and other financial matters. After all, he’s on TV, so he must know stuff! Unlike at the aforementioned baseball games, where it is policy for the camera crews not to show fans who run on the field (because it will only encourage more of them to do it), there is no such rule for the nightly news or morning talk shows. The more crass, insulting or downright dingy Trump gets, the more chance what he says will be covered and he’ll be invited on for another interview. Especially because ‘the business legend’ says these outlandish things, it makes it irresistible to news programs. He yells “you’re fired” on his reality show at a young post-college kid or an ex-meth addict who was on an episode of Diff’rent Strokes in 1982 (all of whom, no matter their station in life, were required to call him Mr. Trump), and boom, it’s on Entertainment Tonight. He also perfectly mirrors a recent trend in America that bigger is inevitably better, whether we’re talking about a structure, a story or a scalp protector that looks like it was produced by a handloom. So there’s the racist, Birtherism, the tales of how “huge” his fortune is – well beyond what we’re privy to, apparently – and the constant harping on how he supposedly ripped off Muammar Gaddafi on a land deal. So there is nothing that is really out of bounds. Hell, I half-expect Trump to announce any day now he’s marrying Miley Cyrus, and plans to change his name to Dr Zeus. So, what better way to get ratings and give the media its eye candy than say that he will announce on the last episode of his show when he will announce whether or not he’s running for president? Is it real? Is it entertainment? Or is it both? You tell me. Either way, it has Trump either tied for the lead or outright winning in two new polls (CNN and Public Policy Polling) of Republican primary voters – even though I don’t suspect it will last or that he will eventually run. But that doesn’t really matter, does it? Because either way, as long as our culture continues to promote these particularly peculiar values, we’ll continue to have Donald Trump to kick us around. The GOP is like the “Chicken Littles” always saying that the “Sky is Falling”, like the same ones that were the “Chicken Hawks” (“W” Wars), big talk no courage. The United States, favors creativity wherever it can be found. We’re apostles of prosperity and defenders of the free exchange of ideas and when more people in more countries are free to rise, to invent, to communicate, to dissent, it’s not the doom of United States leadership, its the triumph of the American way. Generations have worked hard and sacrificed much for the country to reach this point (individuals and our unions! ), and with further hard work and sacrifice (along with our relentless self-doubt) the United States will rise again, we do not tire and we are coming back, no matter what the “Chicken Littles” keep saying about our nation. Never Bet Against the United States! Our current President travelled under a USA passport long before he was elected President, but I guess the quacky BIRTHERS, must believe that the USCIS – United States Passport was in on the lie, please, grow up, you are wrong! Remember when some contractors were busted during the “George W. Bush” administration for looking at our current President passport file (how quick you forget).